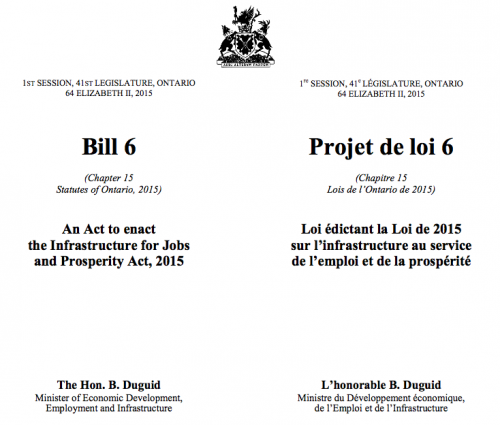 Ontario has taken a major step in the right direction with the passage of Bill 6: Infrastructure for Jobs and Prosperity Act. A large coalition of community partners was successful in advocating for community benefits to be included in this bill. That’s because Community Benefit Agreements (CBAs) support communities by creating jobs and training opportunities and supporting social enterprise activity and other community amenities. CBAs offer an opportunity to engage marginalized populations, including youth and newcomers, in a range of quality job opportunities as part of a large infrastructure investment. This achievement is the result of cross-sectoral collaboration of many community agencies, nonprofits, labour groups and social enterprise leaders working together. However, as we enjoy this victory, it is important to remember that finding meaningful and practical ways to implement this act will be critical, and the Ontario government can benefit from the input of stakeholders and community groups who have expertise to offer in areas ranging from job training to construction to community engagement. We encourage government to consult broadly on regulations when they are developed under the act. The Ontario Nonprofit Network looks forward to working with all stakeholders to discuss next steps and to ensure that the implementation of community benefits legislation works for local communities.